The 2nd Annual Firehouse Chili Cook-Off to Benefit FOF! STEVE BUSCEMI plays God in the new TBS comedy series MIRACLE WORKERS. On Tuesday, March 26th, Steve Buscemi will join Friends of Firefighters in Red Hook, Brooklyn for an exclusive cocktail event and live screening of the final episode of Season 1. Talk life, talk characters, talk film and TV with the actor, comedian, director, and former firefighter while enjoying drinks and assorted appetizers prepared by New York City firefighter and MasterChef finalist Chef Eric Howard and team. Before the show airs at 10:30, sit down for a fascinating Q&A, moderated by actor and director Anatol Yusef, who starred alongside Steve in HBO's Boardwalk Empire. Click this link to purchase tickets. All proceeds support Friends of Firefighters' mission to provide free mental health counseling and wellness services to active and retired FDNY firefighters and their families. For more info, email Marlo at info@friendsoffirefighters.org. Gary Sinise's Firehouse Dinner and Book Launch for Grateful American - SOLD OUT! Part memoir, part investigative history, Finding John is the poignant, emotional story of a firefighter’s life in the months and years after September 11. Join us at Friends of Firefighters on Wednesday, January 30th, 6-9PM, for a firefighter-prepared dinner followed by a reading and Q&A with the book’s author, FDNY Firefighter Captain Andrew Serra. Open to active and retired FDNY firefighters. MEET SANTA AT FRIENDS OF FIREFIGHTERS! Join us on December 12th, anytime between 8-11 AM, for our last On the Arm Breakfast of 2018. Catch up with fellow members over coffee and a hot breakfast that rivals the best brunch joints in Brooklyn. FREE for active and retired FDNY firefighters and their families. Firehouse Kitchen Talk: "Moving Up the Ladder With A Higher Education Degree"
Join us at the 11th Annual Fall Gala! 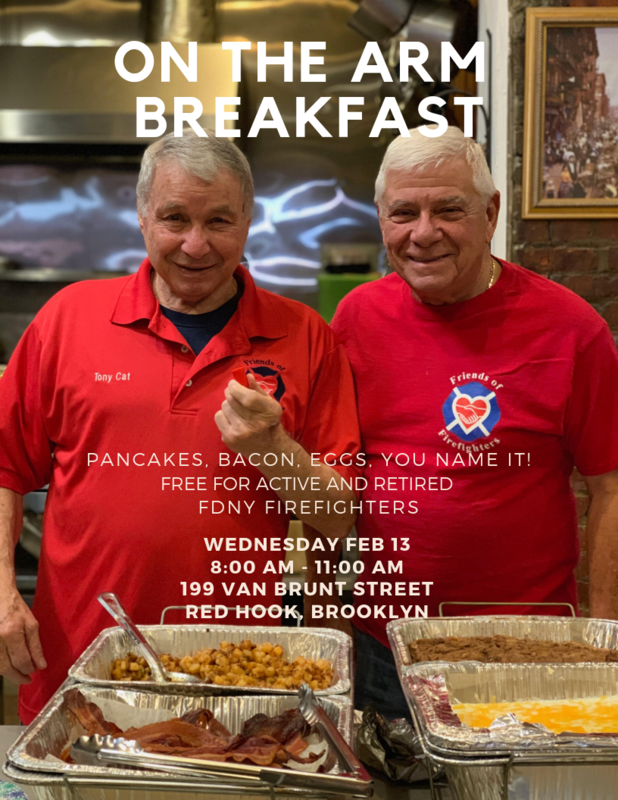 Drop by our historic Red Hook firehouse for a hot breakfast prepared by retired firefighters Tony Cat, Pete Calascione and Billy Hodgens. As always, breakfast is FREE for all FDNY members and their families. No RSVP needed, just your company and appetite. Join retired FDNY firefighter and certified qigong instructor Jonathan Henderson for a 90-minute qigong class and presentation. Qigong is a form of gentle movement and still meditation that uses breath and the mind to work with energy in the body. Jonathan will also be sharing his inspirational story of healing from his 9/11-related illnesses, anger issues and use of prescription medications. This event is FREE of charge and open to the public, so spread the word! Please note childcare will be available upstairs. RSVP to Marlo at info@friendsoffirefighters.org if you plan on attending, and let us know if you'll be coming with your child(ren). Firefighters have filled screens large and small, from The Three Stooges and The Little Rascals, to The Towering Inferno and Backdraft. Pulitzer Prize-winning photos of firefighters risking their lives have long graced the pages of major national newspapers, magazines and books. 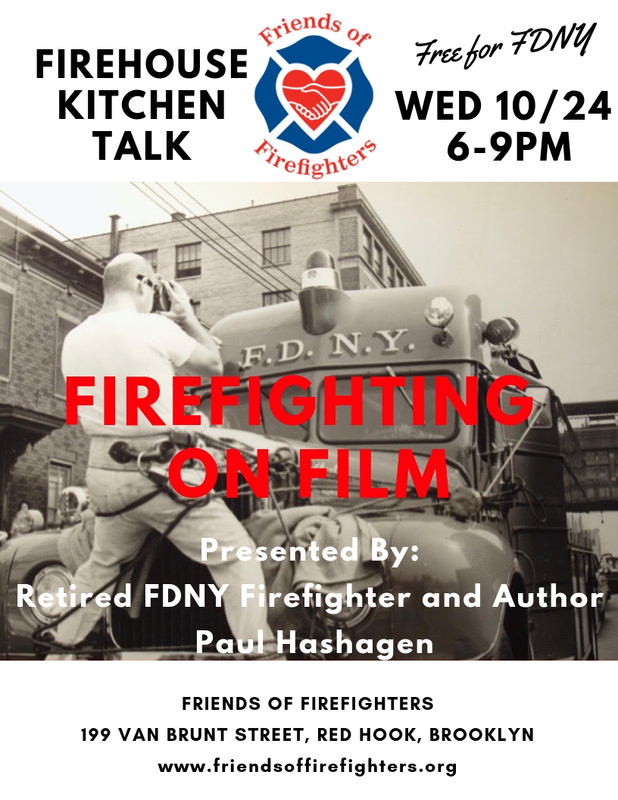 On Wednesday, October 24th, 6-9 PM, we invite you to join us for "Firefighting on Film," a Firehouse Kitchen Talk presentation given by retired FDNY firefighter and author Paul Hashagen. Explore the public’s fascination with fires and firefighting from the earliest days of photography, to Thomas Edison’s first moving pictures and the advent of major motion pictures and television, to today’s social media channels and the 24-hour news cycle. Dinner will be served at 6 o’clock. Open to active and retired FDNY firefighters. FREE.